Instant downloads of all 945 LitChart PDFs (including Riders to the Sea). Welcome to the LitCharts study guide on J. M. Synge's Riders to the Sea. Created by the original team behind SparkNotes, LitCharts are the world's best literature guides. A concise biography of J. M. Synge plus historical and literary context for Riders to the Sea. A quick-reference summary: Riders to the Sea on a single page. In-depth summary and analysis of every Act of Riders to the Sea. Visual theme-tracking, too. Explanations, analysis, and visualizations of Riders to the Sea's themes. Riders to the Sea's important quotes, sortable by theme, character, or Act. Description, analysis, and timelines for Riders to the Sea's characters. Explanations of Riders to the Sea's symbols, and tracking of where they appear. An interactive data visualization of Riders to the Sea's plot and themes. Synge was the youngest of five children, and his father died of smallpox just a year after he was born. Despite his mother’s religious fervor, Synge began moving towards agnosticism after reading Darwin. He attended Trinity College and the Royal Irish Academy of Music, and (despite performing poorly) he cultivated an interest in Irish literature. Synge began writing poetry and spent several years abroad in Germany, Paris, and Italy studying music. In Paris, he was introduced to the renowned writer William Butler Yeats and he was inspired by Yeats’ passion for the Irish Literary Renaissance, a literary movement associated with an increased interest in Irish language and culture. Synge would go on to write poetry, plays, and articles that focused on the Irish culture and peasantry, and though he wrote in English, his writing contained the music of Irish speech patterns. Eventually Synge became one of the three directors of the Irish National Theatre Society, along with Yeats and Lady Isabella Gregory. He suffered from cancer of the lymphatic glands beginning in 1897 and would die from the disease in 1909 in Dublin. 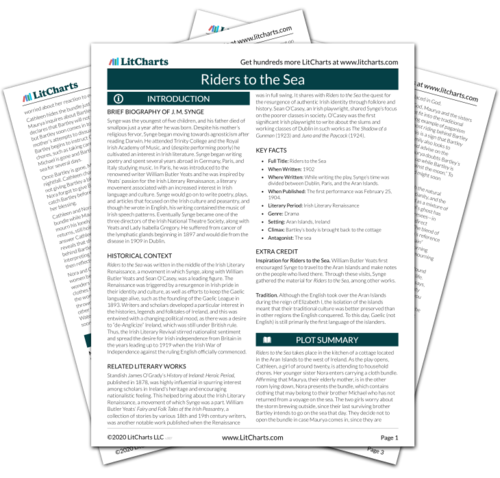 Get the entire Riders to the Sea LitChart as a printable PDF. Riders to the Sea was written in the middle of the Irish Literary Renaissance, a movement in which Synge, along with William Butler Yeats and Sean O’Casey, was a leading figure. The Renaissance was triggered by a resurgence in Irish pride in their identity and culture, as well as efforts to keep the Gaelic language alive, such as the founding of the Gaelic League in 1893. Writers and scholars developed a particular interest in the histories, legends and folktales of Ireland, and this was entwined with a changing political mood, as there was a desire to “de-Anglicize” Ireland, which was still under British rule. Thus, the Irish Literary Revival stirred nationalist sentiment and spread the desire for Irish independence from Britain in the years leading up to 1919 when the Irish War of Independence against the ruling English officially commenced. Standish James O’Grady’s History of Ireland: Heroic Period, published in 1878, was highly influential in spurring interest among scholars in Ireland’s heritage and encouraging nationalistic feeling. This helped bring about the Irish Literary Renaissance, a movement of which Synge was a part. William Butler Yeats’ Fairy and Folk Tales of the Irish Peasantry, a collection of stories by various 18th and 19th century writers, was another notable work published when the Renaissance was in full swing. It shares with Riders to the Sea the quest for the resurgence of authentic Irish identity through folklore and history. Sean O’Casey, an Irish playwright, shared Synge’s focus on the poorer classes in society. O’Casey was the first significant Irish playwright to write about the slums and working classes of Dublin in such works as The Shadow of a Gunman (1923) and Juno and the Paycock (1924). Where Written: While writing the play, Synge’s time was divided between Dublin, Paris, and the Aran Islands. When Published: The first performance was February 25, 1904. Inspiration for Riders to the Sea. William Butler Yeats first encouraged Synge to travel to the Aran Islands and make notes on the people who lived there. Through these visits, Synge gathered the material for Riders to the Sea, among other works. Tradition. Although the English took over the Aran Islands during the reign of Elizabeth I, the isolation of the islands meant that their traditional culture was better preserved than in other regions the English conquered. To this day, Gaelic (not English) is still primarily the first language of the islanders. Vila, Leigh. "Riders to the Sea." LitCharts. LitCharts LLC, 23 Aug 2017. Web. 23 Apr 2019. Vila, Leigh. "Riders to the Sea." LitCharts LLC, August 23, 2017. Retrieved April 23, 2019. https://www.litcharts.com/lit/riders-to-the-sea.